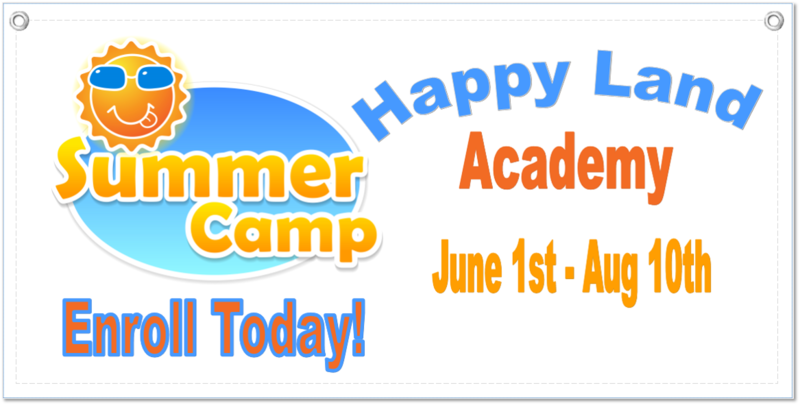 Having a robust summer camp program can mean the difference in having a profitable child care business or losing money. 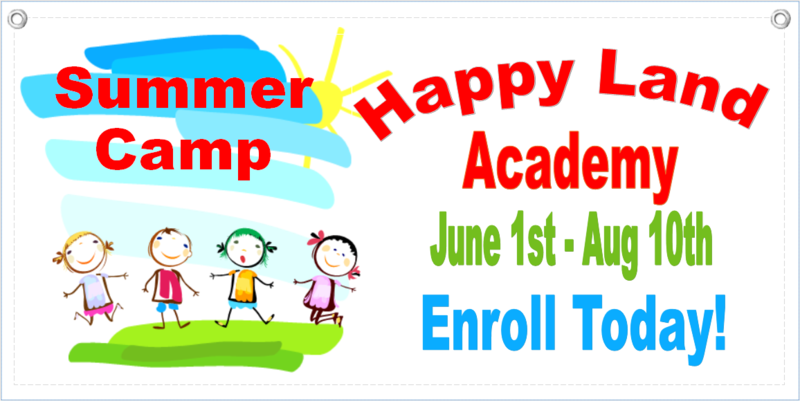 Low enrollment and revenues during the two to three-month summer break can put a strain on cash flow and your overall child care program. 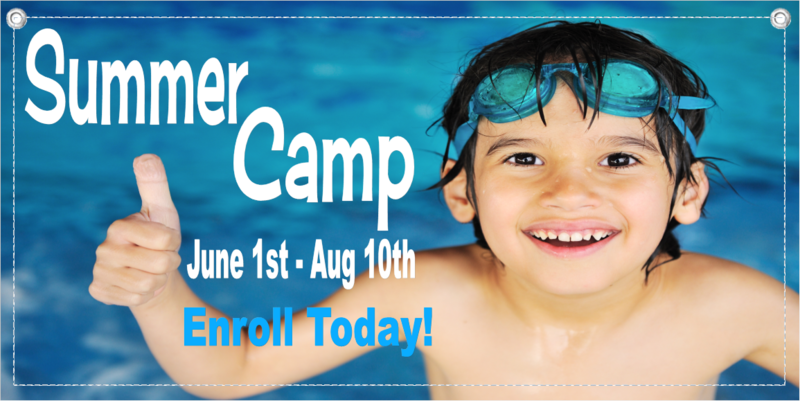 Put an end to low summer enrollment and tight cash flow by implementing marketing campaigns that focus on increasing enrollment for those specific age groups for either all weeks or some weeks during the summer. 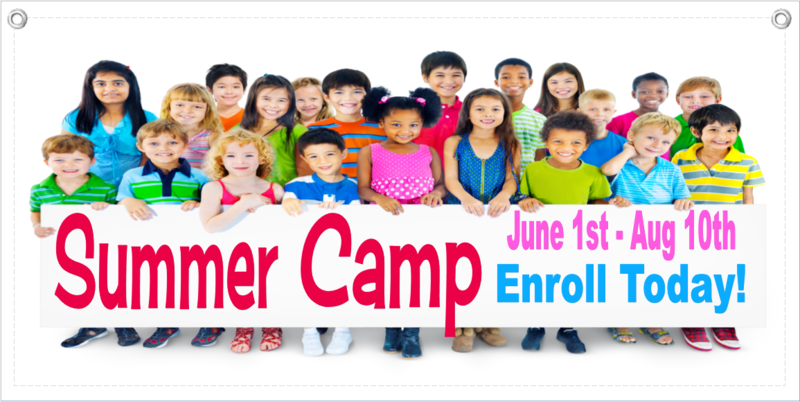 Child Care Owner offers several marketing items that can be utilized to bring attention to your summer program with existing parents and others in the community. Often a combination of a couple of companion marketing items works best. For instance, summer camp postcards provided to each of your current parents – detailing the program with the call to action – “enroll today”. 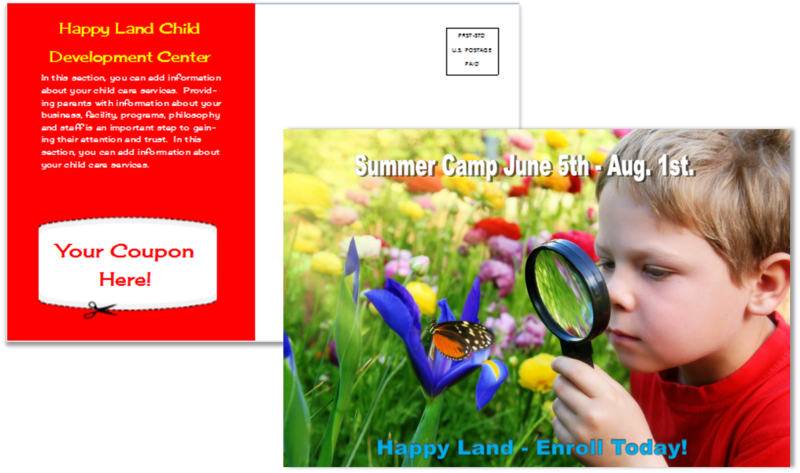 Mail the same postcard to homes within your community with children matching your summer program age groups. 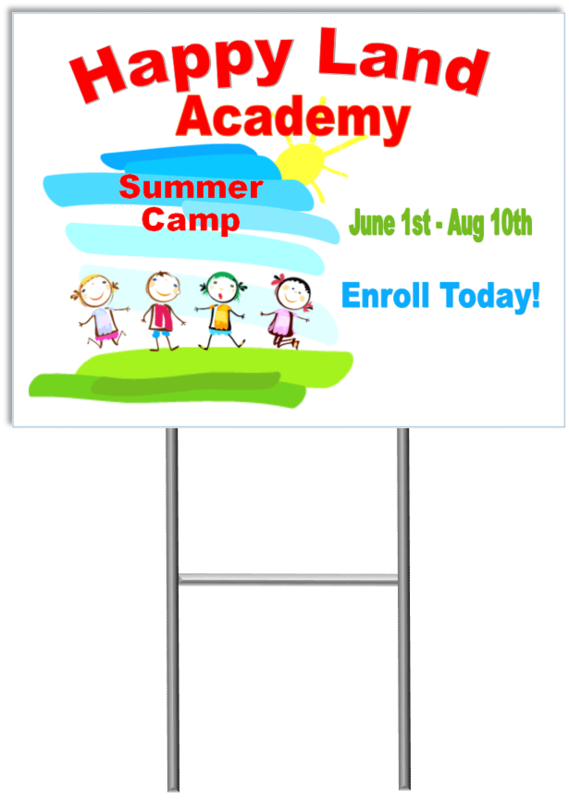 Then carry the marketing campaign another step and install an outdoor banner or yard signs matching the message of your postcard to remind current parents and others driving by your child care business. 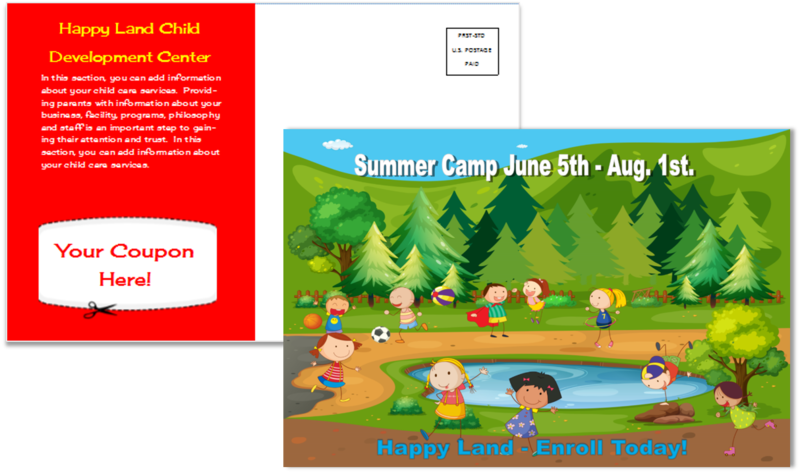 Below are sample banners, yard signs, and postcards you can use for your child care summer camp program. 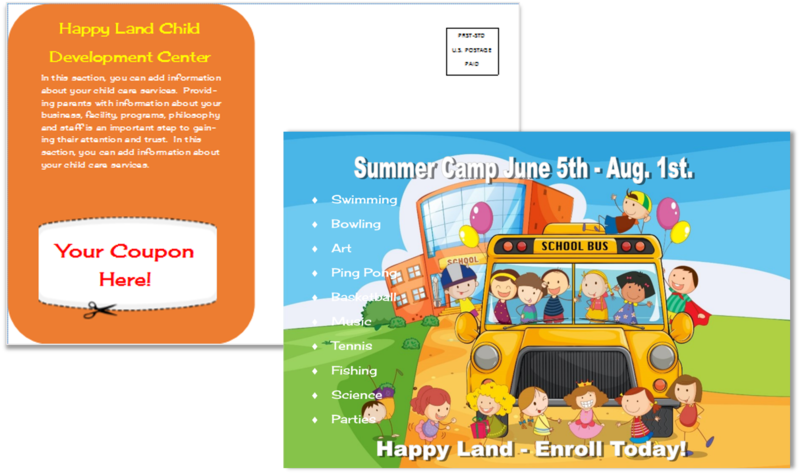 Child Care Owner professional designers will make “minor tweaks” to personalize with your child care business name, logo, desired text and some item color changes (design changes or additional customization will require additional fees). 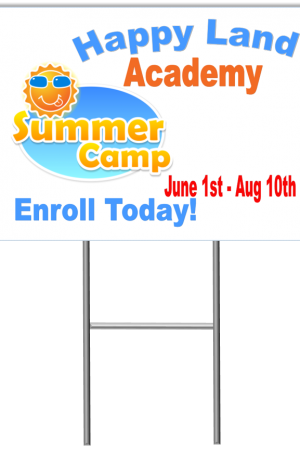 One of our professional designers will contact you after you place your order to obtain your child care business logo and other information needed to personalize your item. 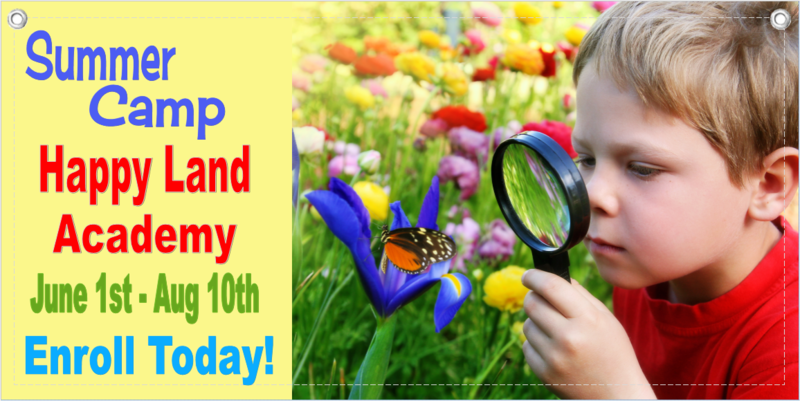 You will be provided a proof of your item for review and written approval before printing. Specifically intended for outdoor use, can also be used indoors. Inks are UV Cured (dried). Waterproof & durable. 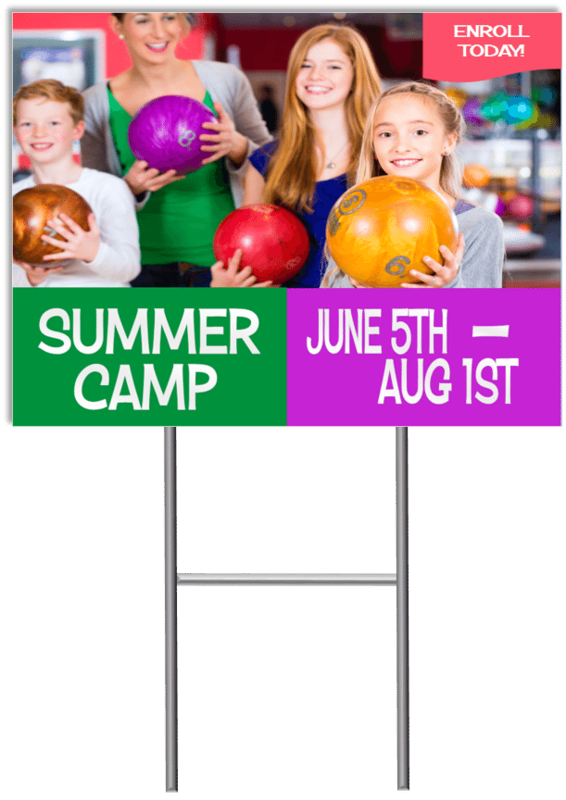 Price includes printing in four-color on the front, blank back, hemmed on all four sides, and metal grommets in each corner to provide for easy hanging. 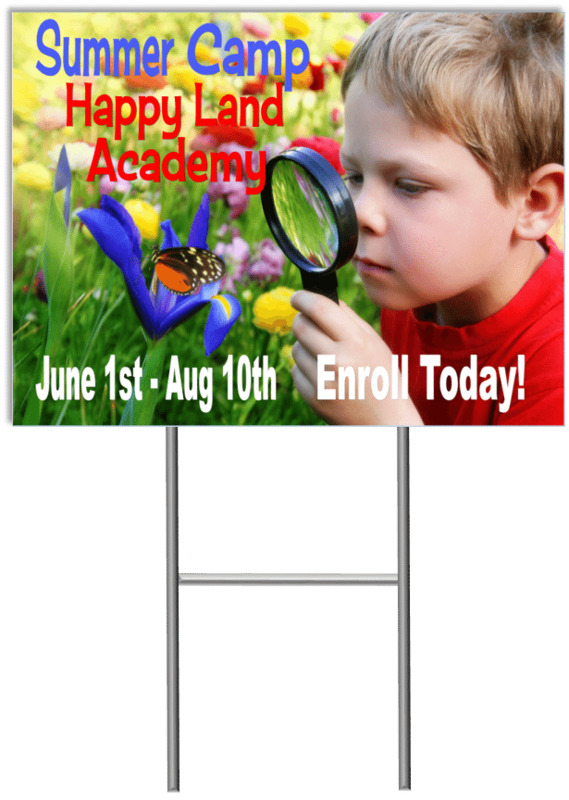 Order as few as one or considering placing one on the outside and one inside close to the main entrance. Available sizes measured in feet. 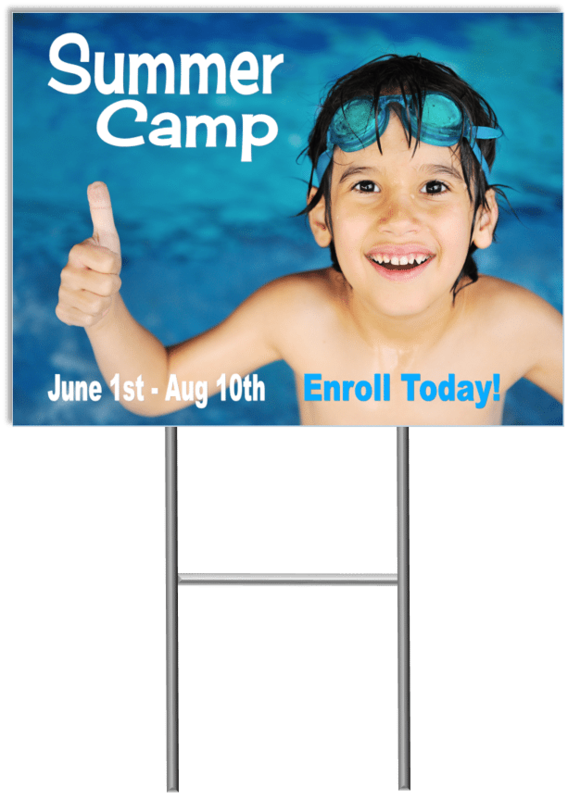 We offer two sign material options for yard signs – 24pt Polyboard with a U-Frame sign base or 4mm Coroplast with H-Stakes. 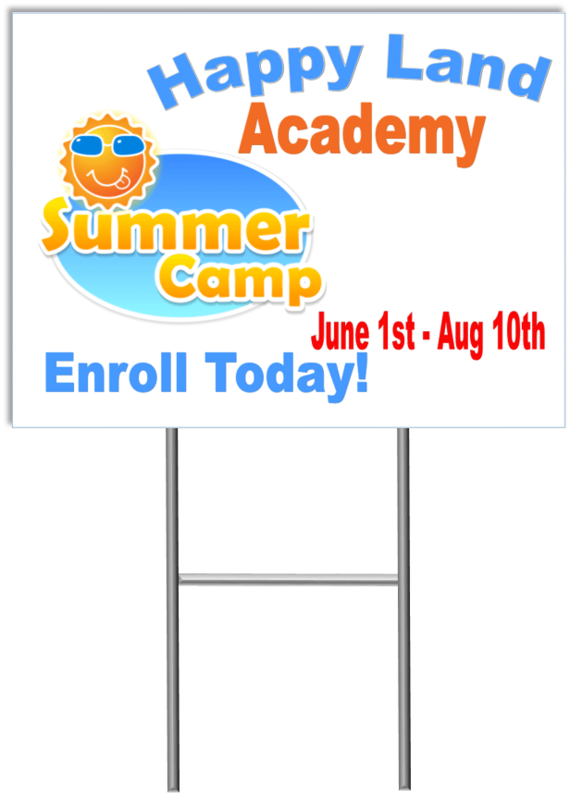 Both materials provide a quality, durable outdoor sign that is easy to install. 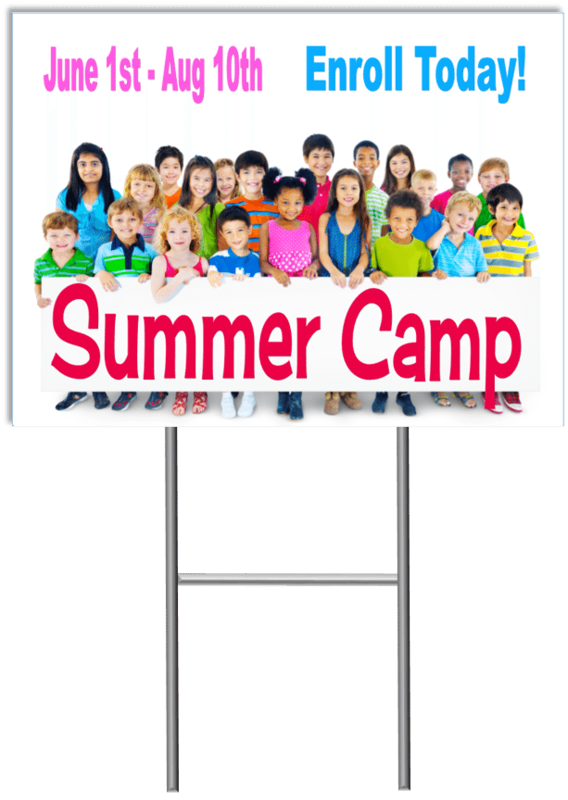 22″ X 24″ – 24pt Polyboard Sign – Four color front and back, comes with U-Frame for installation. 4mm Coroplast – Four color front and back, comes with H-Frame for installation. 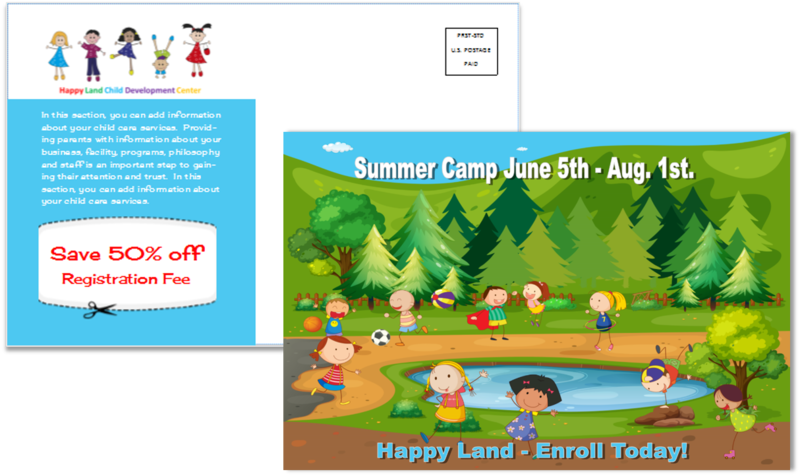 Child Care Owner offers professionally designed postcards for the child care industry. We offer two basic sizes – Small 4 X 6 or Medium 7 X 5 each with the ability to order as little is 250 – 1,000 or more postcards. 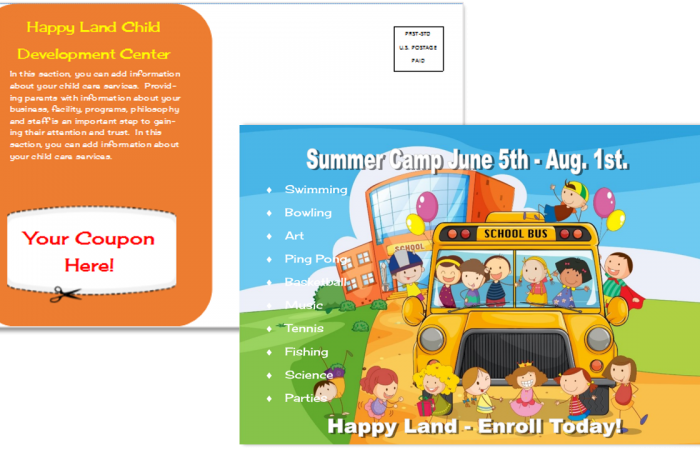 Use Child Care Owner’s easy mailing service! We will purchase a mailing list for your community, have the postcards addressed and pay for postage and processing – all for one low price.